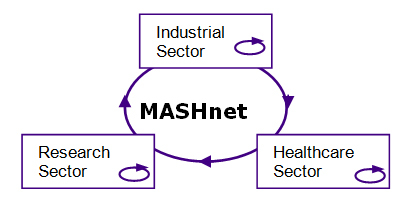 MASHnet seeks to establish a common framework of communication both within and between the three sectors central to the application of healthcare modelling and simulation: health and social services, research and industry. This is an essential pre-condition for more successful development and implementation of applications in the area. MASHnet provides a valuable mechanism for the interchange of information and ideas both within and between the three key sectors of Research, Healthcare and Industry.